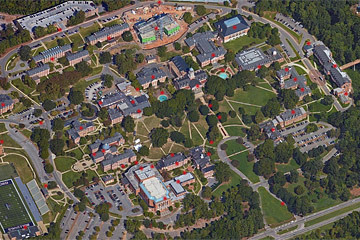 There are 4 sections of dormitories, located in Beeson Woods, Central Campus, West Campus, and West Village. Evergreen Hall, home to approximately 100 female students, is designed in a semi-traditional residence hall style (two adjacent rooms housing two students each share a bathroom). Residents share laundry facilities, kitchen and a large study room located on the lowest floor. All buildings in Beeson Woods except Evergreen Hall are made up of 10 suites, each home to four students. Each suite contains 2 bedrooms, 2 bathrooms, and a living room or common area with a kitchenette. Residents share laundry facilities and a stove/oven located on the lowest floor of each building. Pittman Hall is the most centrally located residence hall. With 84 rooms and 158 residents, Pittman is a tight-knit community. The staff, consisting of one Resident Manager and five Resident Assistants, strives to keep Pittman a place where "everybody knows your name". Pittman is a unique living experience on Samford's campus with an almost equal blend of enthusiastic freshmen and mature upperclassmen. Pittman offers heating and air-conditioning in all rooms, and every room has at least one window. Each resident has her own closet space, desk, chair, chest, twin bed, phone line, and wireless Internet. The majority of Pittman rooms have suite bathrooms (bathroom shared by two rooms), but the fourth floor rooms are served by a community bath. Pittman's lobby is the activity hub of the residence hall with a TV, DVD player, and lounge area. A new kitchen is located on the 1st floor, and laundry facilities are located on the 1st and 3rd floors. Affectionately called "Vail," Lena Vail Davis Hall is the largest residence hall on campus with 198 rooms and almost 400 residents. Vail construction concluded in 1959 and has undergone numerous renovations since then. Most recently, a kitchen was added. Freshmen women make up the entire resident population of Vail. The halls of Vail are adored by generations of Samford women because of the lifelong friendships formed in the stately building. Vail is staffed by one Resident Manager, two Senior Resident Assistants, and seventeen Resident Assistants. The residence hall has a large lobby with areas for snacking, studying, watching TV or DVDs, and playing pool. Vail is divided into east and west wings with a large laundry room on the first floor of each side. Vail offers heating and air-conditioning in all rooms, and every room has at least one window. Each resident has her own closet space, desk, chair, chest, twin bed, phone line, and wireless Internet. Seventeen private rooms are available, scattered throughout the third, fourth, and sixth floors of the building. Community bathrooms serve the majority of Vail, but a few rooms with private bathrooms are available. Smith Hall is a men's residence hall with 103 rooms and almost 200 residents. Smith houses most of the males of the freshman class. Smith has a staff of one Resident Manager, one Senior Resident Assistant, and eight Resident Assistants. Smith is known for the great friendships and fun that develops in its halls. Recent renovations in Smith include bathrooms and new flooring. Smith offers heating and air-conditioning in all rooms, and every room has at least one window. Each resident has his own closet space, desk, chair, chest, twin bed, phone line, and wireless Internet. The majority of Smith rooms have suite bathrooms (bathroom shared by two rooms), but the fourth floor rooms are served by a community bath. Smith's lobby is a great place to play or study with comfortable seating, TV and DVD player, and pool table. Laundry facilities are located on each floor. West Campus provides students the opportunity to live in a well-integrated community offering organizational diversity and quality resident facilities. Students are offered a wide array of programs and activities regularly incorporated into the West Campus living experience by Greek society and Residence Life. Although this area of housing is primarily Greek (app. 75%), Mountainview (men) and Student Apartments provide independent housing for upperclassmen. For students interested in Greek life, a number of fraternities and sororities in this area offer association. Sororities in West Campus include Zeta Tau Alpha, Alpha Delta Pi, Chi Omega, Phi Mu and Alpha Omicron Pi. West Village is our newest residential area of campus, and it is home to 300 students. Located in the southwest corner of campus, this area consists of three residence halls – Barbara Drummond Thorne Hall, Building 100, and Building 300 each housing 100 students who are sophomores, juniors, or seniors. Each apartment/suite accommodates four residents all having his/her own bedroom. The units also contain two bathrooms, a living room, and a kitchen. The bedrooms are furnished with a full-size bed, a dresser, a desk, and a desk chair. The living rooms are also furnished, and the kitchen includes a refrigerator and a stove/oven. The lobby areas of each building in West Village offer common rooms for residents to meet or study. These rooms are furnished with televisions, sofas, and tables and chairs. Laundry facilities and vending machines are located on the first floor of each building.